Regular visitors to Zelo Street may recall the highly creative reinterpretation by the Telegraph of an NHS patient survey that recorded a 99.2% satisfaction rate. This was spun by the Tel as “NHS Shame”, the headline justified by finding that, out of 4,500 NHS wards, the survey responses for 36 of them had been awarded a negative score. The Tel span this as “so bad patients would warn friends and family to stay away”. This was blatant scaremongering, and equally blatant misinterpretation of the figures: the responses for those 36 wards - eight of which were based on a single respondent - merely said that they would not recommend the care given. That, though, does not deter the supposedly quality right-wing press from their mission of creativity, and the Murdoch Times has just been caught doing something rather similar. The paper’s “Social Affairs Correspondent” Rosemary Bennett, who is keeping schtum right now, wrote in May of the “Scandal of ‘appalling’ end-of-life NHS care”. Readers were told that “Hundreds of thousands of people endure a painful, undignified and lonely death because of ‘appalling’ end-of-life care right across the health service, a harrowing report has revealed”. Sounds bad. And there was more. “The health service ombudsman says that too much treatment ‘falls short’ as patients near death, and the failure of doctors to recognise or accept that a patient is dying can lie at the root of the problem”. You may not have heard about this apparently scandalous state of affairs on the TV news. 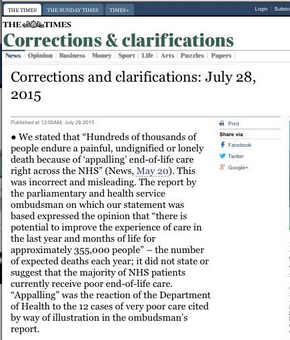 And a “Corrections and Clarifications” entry yesterday shows why. 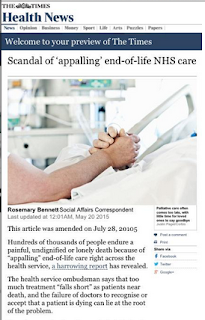 “We stated that ‘Hundreds of thousands of people endure a painful, undignified and lonely death because of “appalling” end-of-life care right across the NHS’ (News, May 20). This was incorrect and misleading. The report by the Parliamentary and health service ombudsman on which our statement was based expressed the opinion that ‘there is potential to improve the experience of care in the last year and months of life for approximately 355,000 people’ - the number of expected deaths each year; it did not suggest that the majority of NHS patients currently receive poor end-of-life care”. So what was the true number for that “appalling” tag? You’ll love this one: “‘Appalling’ was the reaction of the Department of Health to the 12 cases of very poor care cited by way of illustration in the ombudsman’s report”. Well, well. 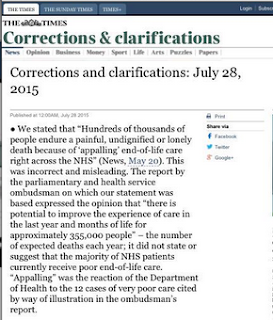 The constant misuse of Hospital Standardised Mortality Ratio data for Stafford Hospital and elsewhere can be put down partly to ignorance - few papers have reporters specialised enough in understanding such things - but the Times “story”, along with the Tel’s equally blatant misreporting two years ago, is down to one thing, and one alone: readers have to be frightened off the NHS, if necessary by lying about it. This, in turn, is used to assist less than scrupulous politicians in their own attacks on the NHS for ideological ends. And that’s not good enough. Look out for those special Govine partnership deals. Buy one story from Murdoch's News get the two of them whingeing in support. As if Murdoch needed a crutch from a former employee and that Dacre poodle. As La Mensch might put it - Gove you're quackers! (Lame duck Minister for non Menschionabalites). Really, Tim, you should know better than to use a tautology like "...quality right-wing press..." - even if it was slightly qualified. There's nothing "quality" about anything that gang of propagandists shovel out. Today, mark my words, we're going to get more of the same about "the Liverpool Pathway." My bet is BBC News will be among the front runners. But it'll be a close run thing as to which newsroom has the most gutless gobshites.